It's been a while since my last outfit post, but now it's the new year and it's time to get back into the swing of things. I wore this outfit following our first major snow storm of the season. I don't own actual snow boots, but my Hunter wellies count, right? At least my feetsies stayed dry, right? Whatchu rockin' post-snowstorm? I really really wanted that sweater. I wear my wellies (with the fleece liners) in the snow often. They have good traction and they're so much cuter than uggs, right? I agree whole-heartedly. Way cuter than Uggs. Even though I rock my Uggs on the reg. Whomp. 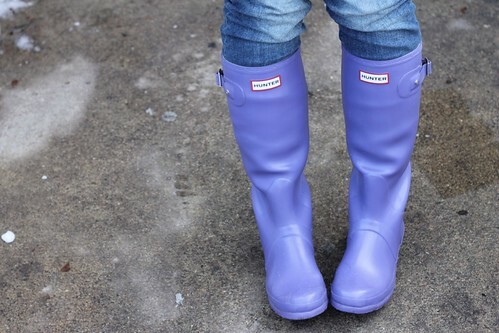 OMG you have purple wellies! That is awesome! ADORE! The purple Hunters are amazing. I love love love. They totally count :) & I LOVE the glasses & sweater! Eee thank you love! AND I'VE MISSED YOU!!! OHMYGAH your purple Hunters are the cutest!! Why oh why didn't I wait it out and go with that color?! Thank yooooou! And I fully condone multiple pairs of wellies. Seriously.